Antique seashell jewelry from the 1930s and 1940s! American GIs brought these treasured jewelry pieces home to their sweethearts from exotic Pacific Rim and Asian ports during pre-World War II and during the World War II years. This valuable collection has existed and has been meticulously preserved in an estate in California for over 60 years until it recently joined my own seashell collection. Antique seashell leis, bracelets, earrings and broaches are included in this fabulous collection. The shells come in every color of the rainbow, with some of the antique findings (lei and bracelet clasps, clip-on earrings, etc) being a piece of art in themselves! I will be adding to this page daily, some pieces will be the original jewelry designs, such as sets including leis and earrings, bracelets, etc. Some of the pieces I will add Hawaiian Sunrise Shell centerpieces to, to give a mix of days of old and new. This will be a fascinating collection of antique jewelry with many different designs to choose from, I hope you enjoy! If you are a fan of Vintage jewelry you have found a page to keep an eye on! * This collection would be of special interest to movie costume designers for use as period pieces! 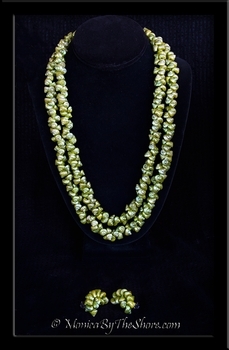 Own a piece of history with this antique iridescent pearl colored Trochus Shell three piece set which includes a 24 inch lei (shown in photo as to be worn doubled), a three strand cuff bracelet, and a matching pair of screw back earrings. 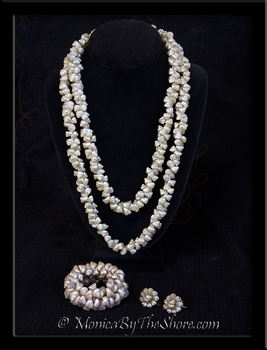 This vintage seashell jewelry set is of the 1940s WWII era and is in perfect, pristine condition. This elegant set is worthy of being a museum piece. A gorgeous set of Polynesian jewelry with so much history, and quite the conversation piece! Wear these shells on a cruise, to a special celebration event or an intimate evening out on the town and be assured no one else will have the same accessories! 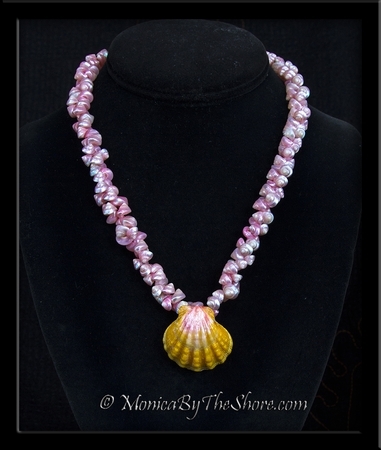 Rare antique seashell jewelry designs presented by MonicaByTheShore, with Aloha on Oahu's North Shore. 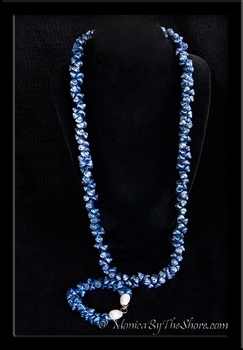 Own a piece of history with this antique, beautifully colored royal blue Trochus Shell lei necklace and bracelet set. The matching bracelet has two Cowrie Shells at the clasp. 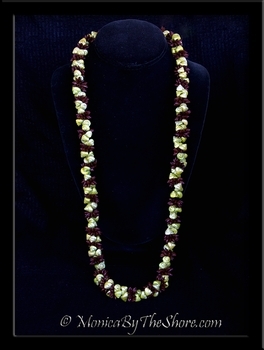 The lei necklace is a total of 32 inches in length. This vintage seashell jewelry set is of the 1940s WWII era. A beautiful set of Polynesian jewelry with so much history, and quite the conversation piece! 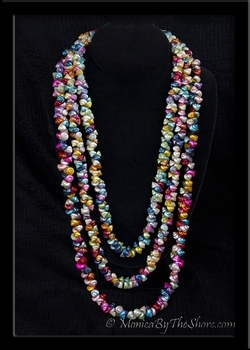 A great addition to any vintage jewelry collection and a gorgeous accessory to wear in your aloha wear fashion wardrobe. 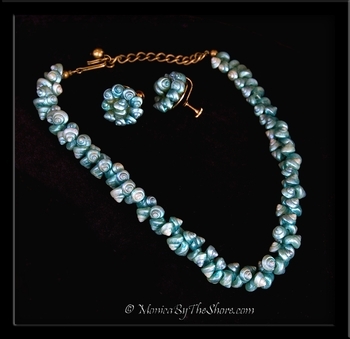 Own a piece of history with this antique aqua colored Trochus Shell lei necklace and earrings set (lei necklace is shown in photo as to be worn doubled). The matching pair of clip back earrings have copper findings and are marked ITALY! 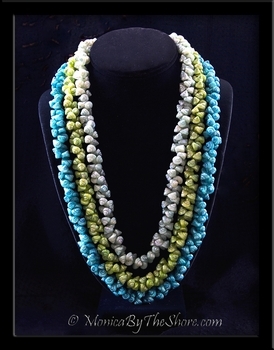 The lei necklace is a total of 44 inches in length and can be worn as a long single strand of shells or doubled as shown in photo. This vintage seashell jewelry set is of the 1940s WWII era. A beautiful set of Polynesian jewelry with so much history, and quite the conversation piece! A great addition to any vintage jewelry collection. 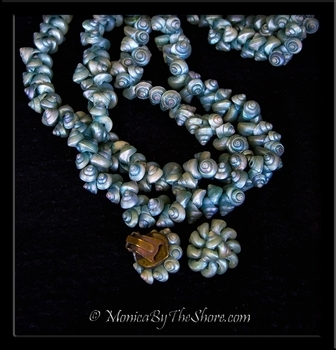 Own a piece of history with this antique tri colored aqua, light green and teal Trochus Shell lei. Pre Art Deco design, this vintage seashell jewelry set is of the 1940s era and is in perfect, pristine condition. The three separate strands of shells are graduated and measure 20, 22 and 24 inches. The filigree clasp finding finishes off this beautifully colored piece of Polynesian jewelry. 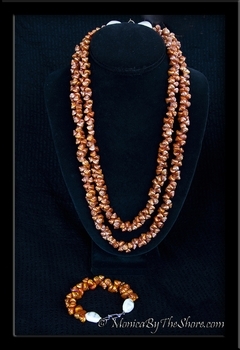 Own a piece of history with this antique, beautifully colored burnt orange Trochus Shell lei necklace and bracelet set. The necklace and the matching bracelet have two Cowrie Shells at the clasp. 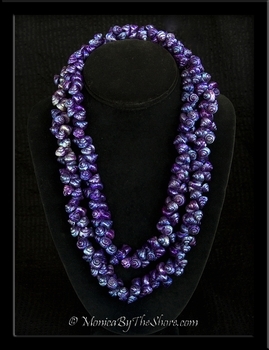 The lei necklace is a total of 46 inches in length and is shown doubled in this photo. This vintage seashell jewelry set is of the 1940s WWII era. A beautiful set of Polynesian jewelry with so much history, and quite the conversation piece! 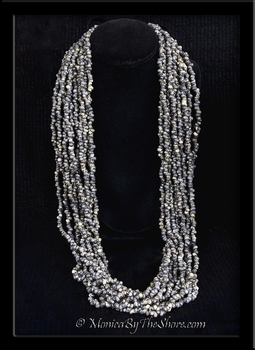 A great addition to any vintage jewelry collection and a gorgeous accessory to wear in your aloha wear fashion wardrobe.